Hope Pizza was incredibly hospitable and welcoming, ushering us in with a super-attentive waitstaff, more than generous management, and two delectable pizzas. The first was a more traditionally Greek selection with sliced tomatoes, fresh garlic, feta cheese, and oregano atop their signature airy, buttery, Greek crust (pictured below sans a slice that Reaves couldn't wait to devour). The second also featured Hope's perfect Greek crust, but was topped a bit more conventionally with sliced meatballs and thin shoestrings of onion. Kait: "Perfection until proven otherwise." Scott: "Perfect buttery, Greek crust, unique texture, huge flavors, not crazy about the feta, though." Allison: "Good cheese mixture, love the feta. Crust = fluffy and delish. A bit too greasy and garlicky, though." Reaves: "Very smooth cheese, good crust, and good balance between the two." 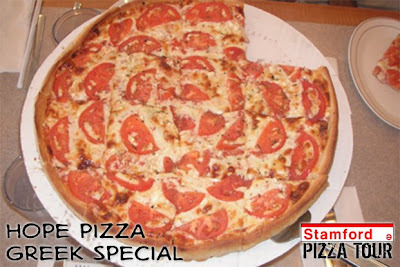 Elliot: "Explosion of superb flavor, steaming hot, buttery, bready crust on a gigantic pizza." 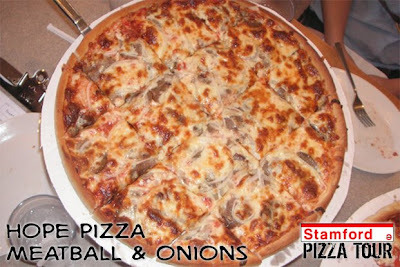 Dan: "The Greek pie was better than the meatball and onions pizza, but both were very good." As you can see, there are not too many bad things to say about Hope's offerings and regardless of their standing, they offer a unique product amidst many Italian restaurants in town that is executed to near perfection. Coupled with a comfortable, homelike atmosphere, this pizza can give just about anyone a good reason to eat out on a Friday night.